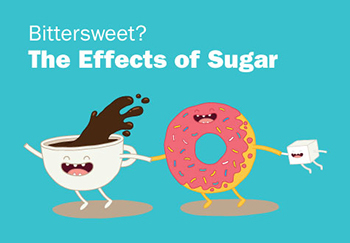 What does sugar do to your body? We’re addressing all your sugar questions in Bittersweet? Effects of Sugar. If you’re like many children of the 80s and 90s, your diet growing up included Sugar Smacks and Fruity Pebbles, Ho Hos and Twinkies, Gobstoppers and Pez. But times have changed. Many parents today are more cautious about the foods they choose for their kids. This shift away from sweet treats is primarily due to an increased awareness about the risks of added sugar. The most recent U.S. Department of Agriculture dietary guidelines for adults recommend that less than 10 percent of our daily total calories come from added sugars — those not occurring naturally in foods like fruits and dairy products. If you stick to a 2,000-calorie diet, that’s around 200 calories or about 6 teaspoons a day. Yet, according to findings by the National Health and Nutrition Examination Survey for 2011-2014, toddlers ages 19 to 23 months in the U.S. consume an average of more than 7 teaspoons of sugar each day. That’s a whole lot of sugar for a little body. Limiting sugar intake to 25 grams (around 6 teaspoons a day) for older kids. Limiting added sugars in our kids’ diets is no easy feat. So we asked clinical dietitian Elina Bank, RDN, about how to cut back and why it’s important. How do I keep track of how much sugar my child is consuming? You might be surprised. Many kid snacks you thought were healthy – fruit snacks, granola bars and yogurts – are actually loaded with added sugar. That’s why it’s important to read nutrition labels before you buy a product. Recently the U.S. Food and Drug Administration changed food labels specifically to show “added sugars” versus just “sugar” in general. Both are listed in grams. If you prefer to measure in teaspoons, take the number in grams and divide it by four — that is the number of teaspoons of sugar per serving. Note that serving size is key, so first compare the serving size recommended on the label to what your child actually eats. This will allow you to make an accurate assessment of true sugar intake. My child is not overweight, so why should I worry about sugar consumption? If you have an active child who is at a healthy weight, sugar may not seem like much of a concern right now. However, the eating habits we instill in our kids while they are young will absolutely affect them into adulthood. Limiting sugar-sweetened beverages and foods with added sugars in childhood will lead to healthier eating and drinking patterns all around. These habits will help your child remain healthy into adulthood. When kids learn to drink a sweetened drink like sweet tea or soda for daily hydration, they’re less likely to drink water as adults. When they learn that good behavior is reinforced with sweets and treats, they may grow up to have a reward center that revolves only around food, which can lead to disordered eating patterns. Starting your kids off on the right foot — with water as the main beverage of choice, and fruits and vegetables making up one half of each of their meals and a majority of snacks — will benefit them for years to come. The idea that sugar causes hyperactivity in children stems back to the early 1970s, when an allergist named Benjamin Feingold theorized that various food additives, such as artificial colors and flavors, trigger hyperactivity. The Feingold diet did not originally include sugar, but later, the diet creators lumped it in. Several studies more recently, however, tested exactly this theory. They were unable to confirm this association between sugar and hyperactivity. But it does not limit sugar. Of course, we can’t entirely discount parental anecdotes. But consider that many of the detrimental effects of sugar have to do with the other ingredients that lurk alongside sugar. When we’re talking about hyperactivity, the main concern is caffeine. Many of the sugar-sweetened beverages that kids are drinking contain large amounts of caffeine in addition to the added sugar. For example, many young people love Mountain Dew; a 20-oz. bottle contains close to 20 teaspoons of sugar and 91 mg. of caffeine. For comparison, your home-brewed coffees are usually 65-100 mg. of caffeine. Your coffee shop brew usually tops out at around 260 mg. of caffeine. What are some alternatives to sugary treats? Cookies and cupcakes are a staple at kids’ birthdays and other events. But there are healthier alternatives that still taste great and will satisfy their sweet tooth. Concerned About Your Child’s Diet? Get more tips on making healthier choices from the UVA Children’s Fitness Clinic. Fruit kebobs: Use toothpicks for the little ones or kebab sticks for older kids. Let them layer their favorites fruits like strawberries, blueberries, bananas and more. Ants on a log: Top celery sticks with peanut butter (ask about allergies first) and raisins. Veggies and dip: Make mini dipping plates, so kids can dip carrots, sweet peppers, cherry tomatoes and more into ranch dressing or other dip. Do-it-yourself baked goods: Make a healthier version of their favorite cookies and breads using sugar substitutes like bananas, dates or applesauce.